Back in 2011, I wrote here about receiving a letter from the Friends of Big Bend National Park telling about the upcoming reopening of the international crossing to Boquillas, Mexico. Long a part of many Texans’ Big Bend vacations, especially my own, Boquillas became off limits to Americans after 9/11. While I was excited about the possibilities of returning, I had concerns about going back after all these years. Would it be the place I remembered and loved so much? Would it be changed? I thought for a long time about whether I should go back or just let it remain in my memory the way it used to be. Over time, I came to the conclusion that I at least needed to take another look. So on two successive trips, one in August 2012 and another in January of this year, I tried to make the crossing only to find that the opening had been delayed while Washington worked out details with the Mexican government. Finally, in July, and again in September, I got to make the trip. 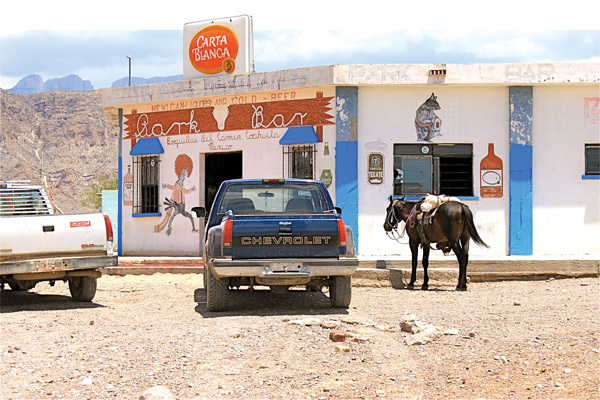 Whether you have been to Boquillas once, ten times, or even if your only experience with the place is through Robert Earl Keen’s song Gringo Honeymoon, you might be interested in what a trip to Boquillas is like today. First and foremost, you must have a passport. Don’t leave home without it. In the old days, there was no need for any kind of identification. Not so today, and driver’s licenses, birth certificates and voter registrations cards are not acceptable. The international crossing is in the same spot as before, along the road to Boquillas Canyon. But before heading there, you will need to make a stop at the Rio Grande Village camp store. While you used to be able to just pay the rowboat captain three dollars for the ride across the river, today you need to buy a ticket from the camp store. The cost has gone up to $5. Put the ticket somewhere safe because you won’t need it till your return trip. From there, enter the international crossing as before. There you will see the biggest change, a new customs and immigrations building where you can park on the new paved lot. The parking is much more secured now, as there are government employees on site. Your trip into the new building has two purposes. The customs people will let you know you must have a passport, though you won’t need to show it till you reach Boquillas, and then again on your return to Texas. Then, they will direct you out a side door that leads down the same old dirt trail to the riverbank. For those who have made the trip before, at this point things are starting to look familiar. Across the river, under a long awning made of desert sotol plants, sits a collection of men, children and burros under a Mexican flag. Some days a guitar player sings Celito Lindo when he sees you appear on the bank. The music continues as long as you are within earshot. Two men then cross the river in a rowboat to pick you up. They help you onboard, then row you across and help you back out onto Mexican soil. From there it is about a third of a mile from the riverbank to the town. To get there, you have three choices: you can go by truck, ride a burro or walk. While both the burro and the truck ride will cost you an additional five dollars (up from three dollars pre-9/11), I suggest you take one of those options. While the walk is short, it is difficult—mostly uphill and often in deep soft sand. If you choose the truck, the driver will stay in town with you, though remaining mostly invisible until you are ready to leave. Once in town, your first stop will be in a new trailer that serves as Mexican customs. Here you will show your passport, get it stamped and be issued a day visa. This stop is mandatory. Be forewarned, the officer there speaks very little English. There are forms to fill out and it may take several attempts to get it right. But don’t worry; he is patient. Then it’s on to the fun, food and drink. As you look around, you will find that not much has changed; walking into Boquillas is still like walking 100 years back in time. While there are a few electric wires strung on poles, the town still lacks electric service. The Sierra Club is blocking electrification in an effort to protect the peregrine falcons that nest on the east rim of the Chisos Mountains. Needless to say, the organization is not viewed favorably by the townspeople. The old restaurant, Falcon’s (pronounced Fal-cones), is unchanged, but the sad news is that its owner and unofficial town mayor, Don Jose Falcon, has passed away. I will miss the long conversations with the fiery little man. His restaurant lives on in the care of his family, in particular his daughter Lilia who returning visitors may remember as the little girl who hung around the restaurant in “the old days.” Now in her twenties, Lilia seems to be the person “in charge” in Boquillas today. She is sweet, speaks good English and loves to talk to tourists who remember Boquillas in the days before the closing. The menu at Falcon’s hasn’t changed much. Plates of very simple little street tacos or burritos, make up the entire menu. The price is still three for three dollars, beer is now two dollars and bowls of jalapenos are still free. The biggest change in town is the presence of a second restaurant directly across the street from Falcon’s. Restaurante Boquillas is owned and run by Don Jose’s nephew, Ventura, and has a menu similar to Falcon’s. As a result, the restaurant is referred to by locals as Falcon’s 2. Offering tacos and burritos, with the addition of enchiladas, the plates at Restaurante Boquillas have five pieces and cost five dollars a plate. Beer here is two dollars as well and the jalapenos are free. Ventura is an engaging conversationalist and speaks English like a native. We passed a fascinating afternoon with him and learned a lot about what has transpired in Boquillas in the 12 years that tourism has been shut down. Most noticeably, the town’s population has dropped dramatically. Ventura told us that many of the able-bodied people have moved off to ranches in the area to find work. Today, there are just 40 families in town. He said that now that the crossing is once again open, people are beginning to return. Ventura went on to lament the change that he found to be the most disturbing: the young people in town can no longer speak English. Because there have been no tourists, there has been no motivation to learn the language. But some things never change. Nothing says Boquillas more than the walk down the dirt road to the Park Bar. Most times you see trucks, burros and horses parked outside. When you walk inside, you can smell the propane that powers the beer cooler. The old man playing the gut string guitar is now down to just five strings, but he is as enthusiastic as ever in his work. The crowds are much smaller (only about ten people the days we were there) but that should change fairly quickly as more of the town’s residents return and Americans learn that the crossing is open. But even here, there was sad news. Several of the old codgers I loved talking with over a few beers have also passed on. But even so, passing a few hours with the mix of locals and Texan tourists made for a very pleasant afternoon. When it is time to leave, you must return the visa to the customs trailer where you obtained it. If you rode in a truck, you’ll find your driver will be there ready for you when you come out. When you return to the river, you will need to give the tickets you bought at the camp store to one of the boatmen at the crossing. You will then be helped into the rowboat that takes you back across into Texas. When you return to the customs building on the Texas side, you will be asked to take out your passport, open it to the page with your photo, and insert it into an electronic reader. Then, you will be instructed to pick up a telephone and have a brief conversation with an officer stationed in El Paso. If all goes well, in just a minute or two your passport will be returned and you can be on your way. In spite of my trepidation about making a return trip to Boquillas, I’m glad I went back. Some old friends have been lost but new ones have been gained. I look forward to a chance to spend another afternoon talking to Lilia and Ventura over a couple of Coronas or Carta Blancas. Overall, I have to say I like most of the changes. While planning is required to have your passport with you, and prices have increased a bit, I still find it an absolutely magnificent way to spend an afternoon. Just like in the old days, I plan to make a run into Boquillas a part of every trip to Big Bend in the future.